As a teacher, you're constantly surrounded by people. But you never have much of a chance to talk about what's on your mind. Instead, you share everything you think will help the minds of the students before you. All day long. Every day. Sure, there are faculty meetings. Department meetings. Intervention meetings. Grade level team meetings. But do you ever really get a chance to just talk to your peers about what's going on in your classroom? To share what's working and what isn't? To ask for help? Not really. And maybe you wouldn't even want to, since there's a good chance you don't know most of them very well. Though I think we can all agree teachers carry a huge weight of emotional concerns for their students and a constant need for new ideas and information, there are very few chances to dispel that weight and feed that need through conversation with colleagues. So, my friend, here are ten ideas for how you might collaborate in a more joyful way with those around you. Whether you're a first year teacher, a veteran, a department chair, or a curriculum coach, perhaps you can get some conversations going and help lead the way in this direction at your school. You can listen to the podcast version below, or on iTunes, Blubrry, or Stitcher. Or just read on! After my first year of teaching, I went to a particularly epic conference called The Exeter Humanities Institute. It was there that I became a die-hard Harkness discussion devotee, and I came back to my school in California eager to share the ideas I had learned. So I started my own breakfast club, inviting any interested teachers at my school to join me for a breakfast conversation once a month about Harkness. At first I shared ideas and answered questions, and gradually as others tried out the method, it became a broader conversation. Maybe there's a subject that interests you or a small group of your colleagues. You might start a breakfast club to talk genius hour, Screencastify, hyperdocs, escape rooms, one-pagers, or some other exciting strategy. Then again, perhaps it should be a wine club, dessert club, or sushi club. Whatever works for you. This is a fun way to combine professional conversations with fun bonding. You're bound to get to know some of your colleagues better at the same time that you learn with them and from them. We've all sat through the dreaded faculty meeting that doesn't apply to us. Ew. Nothing like being taught how to teach reading when you've already been teaching it for twenty years, or hearing about how to use a new tech tool that would never work for the specific group of students you're teaching. Perhaps it's time to lobby your PD coordinator to let your faculty form into PD teams. Let interested parties sign up for what they'd actually like to learn about. Then your team can grab an empty classroom and dive into a subject together. Maybe a group of stressed-out and overwhelmed first year teachers can participate in Angela Watson's 40 Hour Workweek Club together. Maybe another group will get a Breakout EDU membership and work together on building escape rooms that can be used throughout their departments. Maybe one group wants to take Jennifer Gonzalez's JumpStart Teacher Tech (yes, that's my affiliate link, because I really believe in Jenn's good work) course. Maybe another group will dive into the teacher blog world and learn everything they can about genius hour, then present it back to interested sectors of the faculty. PD teams could look different at every school, but the main thing is, every teacher gets to choose what will actually help her become better at reaching her students. Have you heard? Some conferences are FREE, and they are actually some of the best ones. Hosting an unconference just might make you feel more connected to other teachers than anything else could. An unconference, sometimes called an Edcamp, brings together likeminded educators to share their ideas for a day. Doesn't sound that crazy, does it? But here's the spin, nothing is planned until the day of. In the morning, someone puts up a blank schedule on a wall, and people can sign up to lead conversations and share ideas in all the slots. As the day goes on, you might feel inspired to sign up for an afternoon session, even if you were too nervous to start as a presenter in the morning. People simply look at the board and go where their interests lie. No major pressure. No cost. No crazy tech. Just teachers getting into rooms together to talk about what really matters in their classrooms. You could host an unconference within your own faculty, collaborate with other local schools, or go big with something statewide. Sometimes the thing that breaks down the most barriers between teachers has nothing to do with teaching. It's just a simple chance to spend time together away from the pressures of work. Maybe you organize a day out at a minor league baseball game for your department, families and significant someones welcome. Maybe you borrow an idea from the faculty at one school where I worked and throw an over-the-cheesy-top nacho-making competition, complete with judging, rubric, and prizes. Maybe you invite everyone you work with out for cake batter frozen yogurt with rainbow sprinkles. Whatever you choose, getting together outside of work strengthens relationships inside of work. You're a lot more likely to collaborate with the person you made the contest-winning nachos with than a stranger down the hall. There's a lot going on online when it comes to teacher PD (as you clearly know). 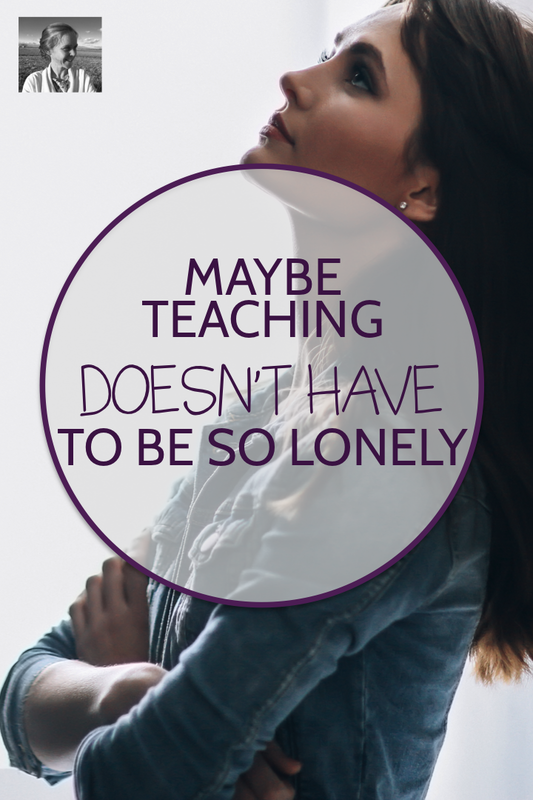 Maybe you've found a teacher blogger that you love, a podcast you enjoy listening to, or a Facebook group that you're fond of. Wouldn't it be nice to share it with a colleague or two? I host the Facebook group, Creative High School English, and I love talking to all the amazing teachers inside. I also love that one of them is actually a colleague of mine right here at my school. It's fun when I get a chance to tag her to answer a question about something I know she's brilliant at, and I always like to see her ideas mixed in with everyone else's. Consider bringing your department along for the ride when you find a great place to collaborate or learn online, wherever it is. While I love being part of a giant group on Facebook, collaborating with teachers across the world, if I was a department chair right now I would start a small group just for my department. It would be a place for us to share our wins, post photos of amazing projects, ask questions, and link to great resources. The first few minutes of every department meeting could be a time to pop into the group and make posts and comment on other's posts. (A bell ringer for teachers!) It would be such an easy, informal way to support each other. And the department chair could make it a point to be in there once a day for a few minutes, checking up and answering questions quickly. That way no one has to wait for a free moment in the halls - which will never come - to ask a question. Another fun way to come together as a department and do something meaningful is to choose a subject that everyone is interested in, whether it's independent reading, making grammar more interesting, improving the feedback process, using workshop, etc. and have everyone spend time during a department meeting (and beyond) doing research into the topic. Then bring the group together to share ideas over coffee, lunch, or dessert. Make it a chance to share great ideas and enjoy some time together too. Many schools have a half-hearted "mentorship" program that matches new teachers with experienced ones in a formal relationship. But how often does that mentorship really work out? Sometimes you have to go outside the boundaries of programs like this for true mentoring relationships to develop. I had two wonderful mentors my first year of teaching, but neither was assigned to me by the school. One invited me to lunch once a month and just listened and said supportive things. The other kept a steady funnel of classroom ideas flowing into my ears. So if you're a veteran teacher, maybe it's time to seek out a new teacher and be the support she needs. You're likely to learn a lot from her even as you help her survive the exhaustion of that challenging first year. And if you're a new teacher, maybe it's time to pick up an extra large Americano on the way to school and drop by the desk of the wise teacher you wish would be your guru, hand over the coffee, and start asking questions. There's a reason why one billion people use Instagram. We like visuals. One cool way to get more conversations going between teachers is to turn your school hallways into galleries for student work. Make that empty gray corridor into a giant bulletin board of student projects, and soon you'll want to drop by the room down the hall and learn more about the genesis of the amazing projects displayed outside of it. And you'll be receiving complimentary inquiries about the one-pagers, food trucks, blackout poetry, and more displayed outside your door too! #10 Retake the Faculty "Lounge"
The faculty room/lounge/work area COULD be such an amazing space. A place where people could sit down and share ideas, pick up an excellent PD book, take a peek at bulletin boards filled with conferences, journals to submit to, and recommendations for great websites, Ed Twitter Chats, and Instagram hashtags to check out. There could be healthy food now and then as well as candy, new curtains as well as long lines for the photocopiers. If you build it, they will come. If you can find a way to get a few people on board with making the faculty room a nicer place, a gossip free zone, a place to collaborate and not complain, your movement will hopefully generate momentum. Time for a #makeover. Well, there you have it. Ten ideas for building professional community and friendships at your school. It's not easy being the only adult in the room 95% of the time during your day, and it helps a lot to have people you trust around you. Yet teaching is rarely very collaborative. Sure, it's fun to have your own domain and teach just the way you want to, but it would be nice to have a support network right outside your door. Maybe you can be part of starting that at your school. Maybe you can start tomorrow. I'd love to see and hear what you do. Please tag me on Instagram @nowsparkcreativity with photos of your unconference, faculty room makeover, breakfast club, hallway galleries, and more, or share your progress in our Facebook group, Creative High School English.